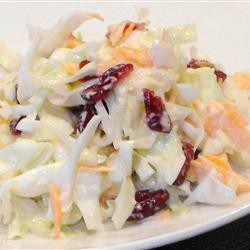 This is one of my favorite kinds of slaw. The pineapple makes it so fresh-tasting. The raisins and coconut are great additions for a Hawaiian flavor. Kids will like this one and can help make it. You can buy the bagged pre-shredded slaw mix if you don’t want to shred your own. Just add drained crushed pineapple, raisins, and coconut. Add mayo to taste. When we are invited to a potluck & don’t have time to make something, we buy 3 large containers of Kentucky Fried Chicken cole slaw and add a can of pineapple tidbits to it. It always gets compliments! My pleasure. It’s really good & so easy! Thanks for your comment, Cheryl!